Today on homify we are travelling to the history-rich city of Berlin, Germany to check out a unique, contemporary dwelling that truly stands apart from the surrounding architectural vernacular. Traditionally in Germany, homes are built with gabled roofs, small windows, and covered with a stucco-style finish. Jacob House, as it is known by Innen Architektur Berlin, is a surprisingly and thoroughly intriguing departure from this. The external structure itself is a combination of textures and tones, with a simplistic timber frame and ample glazing. The home works with the adjacent landscape and blends into the environment easily and elegantly. Inside, the residence boasts an open-plan layout, stunning features, and everything one might require for comfortable 21st-century family life. This dwelling imparts a sense of originality within this neighbourhood’s aesthetic, boosting its style, sophistication, and design nous. 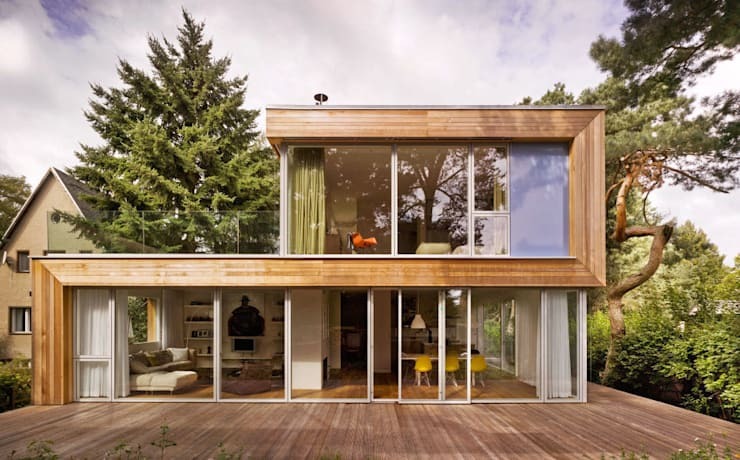 If you would like to take a tour inside Jacob House and see what Susanne Kaiser of Innen Architektur has developed, check out the images below and obtain a little inspiration for your abode today! As we view the home from the back garden and decked terrace, it is clear this is a house that truly stands out from the rest. The timber-clad frame works its way around the glazed walls in a zigzag fashion, evoking interest and flair. Inside the home, the décor and interior architecture definitely doesn’t disappoint! The bright dining room is filled with a light buoyant ambience, replete with ample natural illumination. Whimsical white curtains are draped from the ceiling to cover partial areas of the glazed walls, adding a sense of warmth and privacy to the property. The furniture is a true standout feature here, boasting gorgeous lime and mustard dining chairs that seamlessly inject trendiness and chic style. One of the nicest elements within this room is the pairing of white walls and large polished timber floorboards. The timber imparts earthiness into the area, while the white hue reflects the abundant light that enters. Situated on the ground floor of the dwelling is the child’s room. This space is bursting with excitement and playfulness, perfect for a little one to rest, invent and create. 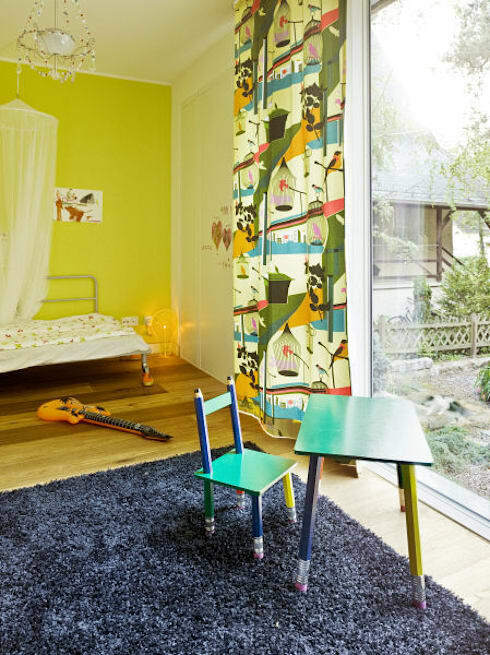 The curtains are patterned with bright primary hues that reflect the chartreuse feature wall, and unique furniture. Here emphasis is put on creating energy and liveliness, with a large window that again fills the room with bright, natural light. 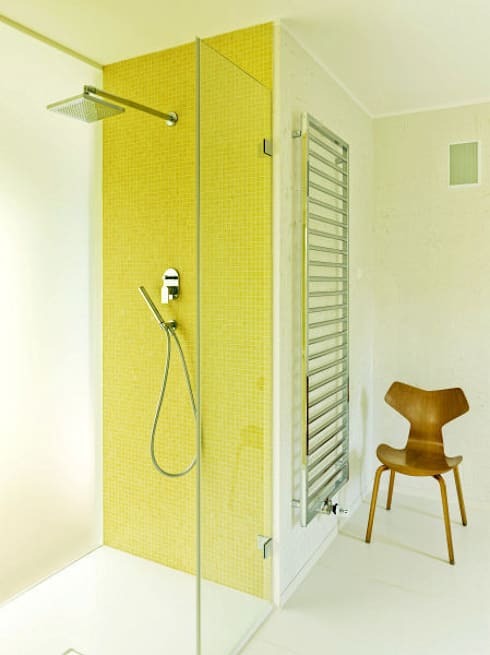 Entering the bathroom we see the chartreuse hue repeated with mosaic wall tiling. This bright hue allows the room to feel overwhelmingly fresh and lively, with an emphasis on minimalism. 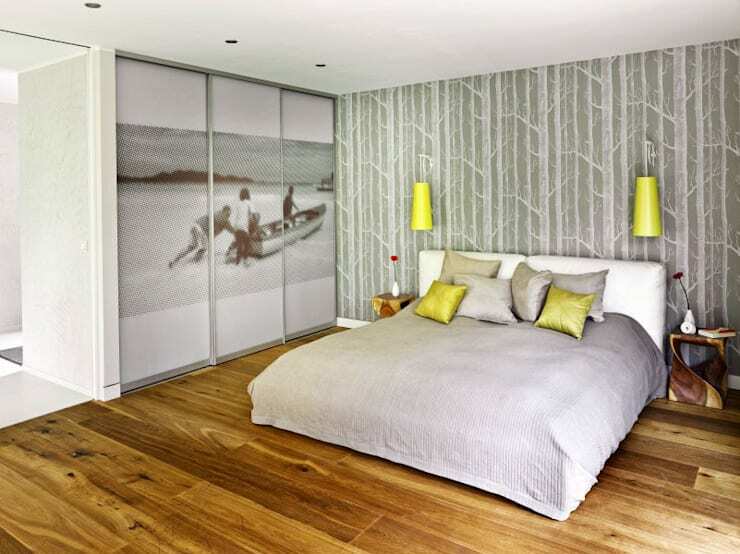 Here the only furniture we can see is a mid-century modern timber chair that has been placed alongside the heated towel rail. Feature elements of this space include the frosted glass wall, large rain showerhead, and clean minimalist design. In this room importance is placed on relaxed yet clean living in a tasteful and sleek environment. Moving up to the second floor of the home we enter the inspiring home office. This space is filled with light and boasts a similar chic colour scheme as the living area. Again full height windows illuminate the room with ease, adding a sense of serenity that is often a much-needed component when working from home. Furniture is retro in its mid-century vibe, imparting luxury and interest into the room. Finally, yet no less importantly, we check out the master suite. This room is alive with a number of different features that add to the overall ambience and welcoming nature of the home. The upholstered white bedhead is sumptuous, and paired with multiple throw cushions for that truly lavish feel. Continuing the chartreuse hue through the home, the bedroom enjoys two wall-mounted lamps that sit elegantly to the left of the organic timber side tables. What is really impressive within this space is the tree trunk wallpaper and matching family photo that have been added to the wall and robe respectively. Often built-in robes lack interest and can look unsightly, but in this case it is a feature within the home. This dwelling is cosy, light-filled and a wonderful example of how contemporary architecture can create living spaces that are sympathetic to the surrounding environment, while offering luxury and liveability. We hope our home tour provided you with some fabulous inspiration and ideas. If you would like to continue reading, check out: How can I increase the value of my home? What do you think about this light-filled abode? Would you like to live here? Let us know by leaving a comment below!